WASHINGTON, May 22, 2018 /PRNewswire-USNewswire/ -- Nine in 10 emergency physicians responding to a new poll say that in the past month, they have experienced shortages or absences of critical medicines in their emergency departments. In addition, nearly all (93 percent of 247 doctors) say their emergency departments are not "fully prepared" for patient surge capacity in the event of a natural or man-made disaster, or mass-casualty incident, with 49 percent saying they are "somewhat" prepared, according to the poll conducted by the American College of Emergency Physicians (ACEP). "These results demonstrate why there needs to be a much stronger focus on the medical aspects of preparedness in the Pandemic and All Hazards Preparedness and Advancing Innovation Act of 2018 [PAHPAI] that is currently being drafted," said Paul Kivela, MD, FACEP, president of ACEP. "Hospitals and emergency medical services continue to suffer significant gaps in disaster preparedness, as well as national drug shortages for essential emergency medications. These shortages can last for months, or longer, and constitute a significant risk to patients. Emergency physicians are concerned that our system cannot even meet daily demands, let alone during a medical surge for a natural or man-made disaster." According to the poll, nearly 90 percent of responding emergency physicians report having to take time away from patient care to explore the viability of alternative treatments and medications. In addition, nearly 70 percent say that drug shortages have "increased a lot" in the past year. "Congress must recognize that current shortages of essential emergency medications are a substantial threat to our nation's preparedness and response capabilities. ACEP urges lawmakers to establish an inter-agency, inter-departmental, and multi-disciplinary task force that includes representation from the HHS Assistant Secretary for Preparedness and Response, the Food and Drug Administration, and the Drug Enforcement Administration, among others," said Dr. Kivela. 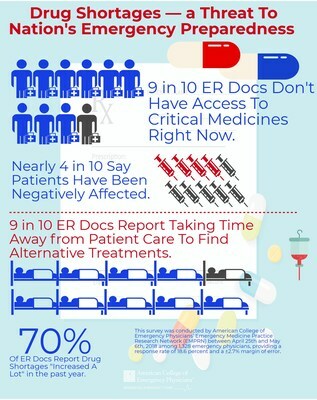 This survey was conducted by American College of Emergency Physicians' Emergency Medicine Practice Research Network (EMPRN) between April 25th and May 6th, 2018 among 1,328 emergency physicians, providing a response rate of 18.6 percent and a ±2.7% margin of error. For complete poll results, please click here or contact Mike Baldyga at mbaldyga@acep.org.